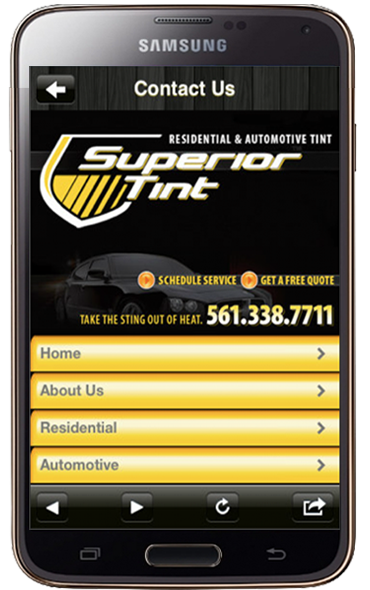 Superior Tint delivers top-quality, state-of-the-art window tint installation as well as professional residential, and commercial glass protection. We are an authorized dealer for Solar Gard and are backed by a manufactures satisfaction guarantee. As a locally owned and operated company our goal is to provide Boca Raton and surrounding areas with professional installation at a competitive price. Checkout Our Mobile App Now! Superior Tint offers a wide variety of custom installation window tint, films and custom decals. Every tint is precisely computer cut using your vehicle's specified template so there is no need to hand cut patterns to fit your vehicle's windows or painted surfaces. Our high quality transparent lens film is a flexible vinyl material that adds a unique look to your headlights, tail lights, fog lights, interior lights and any other type of light with a lens. Adding lens film not only adds style, it adds protection from scratches.